If you are looking for the best Graco high chairs in the market, it will be helpful to consider the different models that will be mentioned in the rest of this article. Along with the identification of these models, some of their most notable features will also be noted to make it a lot easier for you to end up with the best possible choice. It is a known fact that there are numerous high chairs that one can see when looking for the ideal choice within this product category. The multitude of options makes it quite challenging to decide, but such should never be an excuse for the failure to carefully evaluate the options that are available. Graco is a brand that has long been trusted in the market for baby products. The same thing holds true in the case of highchairs. Over the years, Graco has perfected various technologies to make sure that their feeding chairs are of high quality compared to the offerings of their competitors. I have read many customer reports and Graco highchair reviews from experts to find out which are the best Graco feeding chairs. I will share with you models that have been given high ratings and positive feedbacks, which will be an assurance of their superior quality. 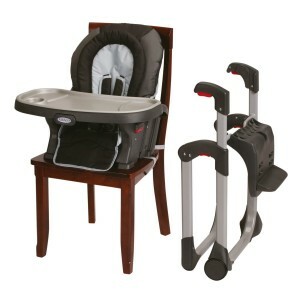 The stability of Graco Contempo high chairs is one thing that has been liked by many parents who have brought such. Because of this, you can have an assurance that it stays firm on the ground and will not be shaken with the movements that will be made by the baby, and hence, making it good with regards to safety. 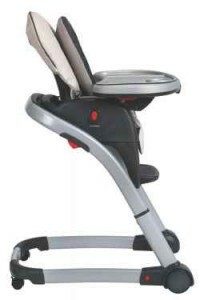 Among all of the highchairs that are offered by the manufacturer, this is considered to be the slimmest. That helps to save the space when it is used or stored. It is also foldable, which means that it will only need very little room when stored and not used. 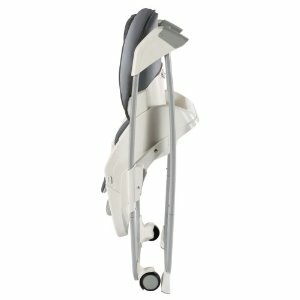 It comes with six-position height adjustment that is beneficial because it offers a high level of flexibility. It means that even after a long time, while your baby grows, the highchair can still prove to be useful. You just need to make a few adjustments in its height. If you are looking for a highchair that has multiple functions, Graco DuoDiner is most probably one of the best options. It can function as an infant high chair, toddler high chair, and booster, which means that it can be functional along with the developments that will be evident from your child. It is also a good thing that this feeding chair is excellent when it comes to ease of cleaning. For other parts, you have to wipe it gently to maintain its best possible condition. For the seat pad, however, it can be machine-washed to make sure that the dirt and stain can be thoroughly removed. The harness system, which can be in 3-point or 5-point system, is also worth lauding. This is a good thing because it allows the provision of the highest level of safety for the baby while being seated in this chair. This is an important feature, especially given the fact that the baby can do a lot of movements while in the high chair. Versatility is perhaps one of the best words that can most closely describe the Graco Blossom Chair. While it is typical for the products within this category to deliver three functions in one, this model has four features. 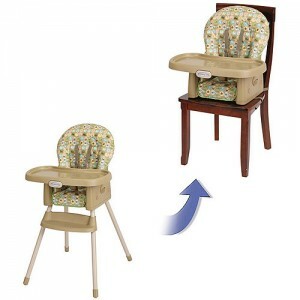 It can be a high chair, infant feeding toddler booster, and youth chair. Another reason on why Blossom chair is versatile, it has 6 different adjustable height positions to fit the growing needs of your baby. This chair also comes with three different recline levels, allowing you to choose the body position at which your baby will be most comfortable with. If you are worried about the comfort of your baby, there is no need to be because it comes with well-padded seats to be assured of your baby’s convenience. More so, for your comfort, this product is easy to clean. Aside from the machine-washable padded seats, the trays are dishwasher-safe. 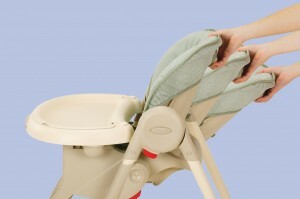 The SimpleSwitch high chair from Graco is a popular option for many people mainly because of the one-hand removal of the tray. It makes it a snap to get your child in and out of the chair. This has been enjoyed by many people who frequently allow their child to be seated on a highchair when eating. The built-in leg storage is also a useful feature, which is for sure a good thing because it helps to save space. If your child has already grown to be more independent, the legs can be easily removed. This is also a good thing as it allows you to easily take the booster when you go out. For many parents, they have also liked the fact that this feeding chair is an inexpensive option, making it an excellent budget-friendly choice. To add, it is also excellent in terms of safety, which it is mainly because it is made of polypropylene, which is a safe material for babies. For parents who have bought this specific type of high chair for their babies, one thing that they have liked is its one-of-a-kind design. The Graco TableFit high chair can be easily slid on the table, which makes it perfect for family bonding time inside the dining room. To add, for those who are concerned about the safety of their child, this comes with an infant body support. This is an ideal feature for those who are worried that their babies might be too small for the chair. It provides the right level of support to keep the infant in a stable position. Aside from the infant body support, there were also many parents who have liked the fact that it can be reclined in various positions. Therefore, there is a possibility of choosing the angle or the position that can prove to be best depending on the mood and preferences of your child. The reasonable price is perhaps one thing that will make this highchair a good choice. Given the vast array of models within the product category, Graco MealTime highchair is one of the most excellent options in terms of price. However, even if it is cheap, quality and functionality are never sacrificed. If you are thinking of changing the position of your baby every time the highchair is used, it will be possible with this model. It offers the possibility of adjusting the height in four different levels and the recline position in four different angles. Many parents who have decided to opt for this model have also reported a high level of satisfaction over the fact that it is easy to clean. The tray can be easily washed in the dishwasher while the padded seats are machine-washable, making it a snap to take out the dirt that has accumulated in the unit.